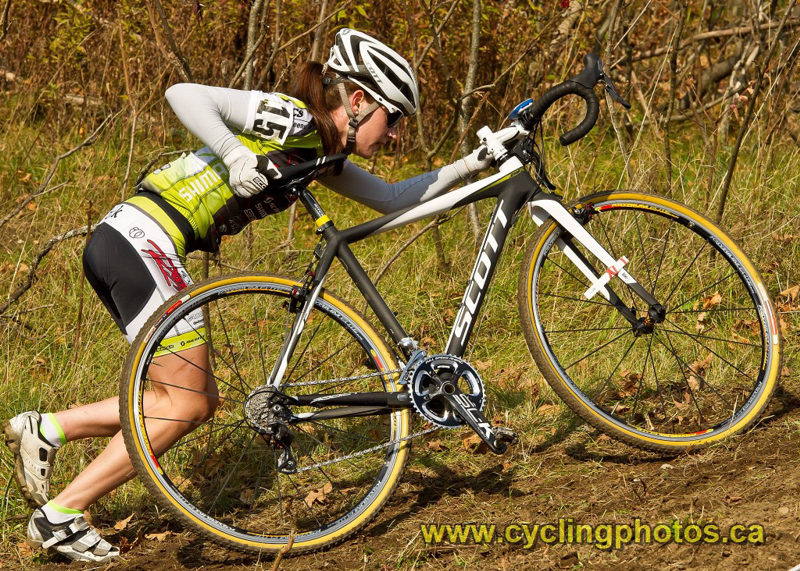 Laura Bietola (3 Rox Racing) and Andrew Watson (Norco Factory Team) won the Elite categories at Sunday's Hardwood Cross race. Held under sunny but cool conditions, the seventh stop of the Southern Cup cyclo-cross series provided an opportunity for riders to fine tune their form in advance of next Saturday's National Cyclocross championships. The three kilometre course featured a sand pit, one set of double barriers, a couple of run-ups, a half corkscrew, and some off-camber sections. Leigh Hobson (The Hub Race Team) led at the start of the Elite Women's race, but Bietola soon took over and held a five second gap at the end of the first lap. A further 15 seconds back was Briana Illingworth (True North) followed by Lapdogs teammates Julie Marceau and Christiane Knobbe. Hobson dug deep and regained Bietola's wheel as the pair entered the 20 metre-long sand pit for the second time. Bietola flawlessly powered through the sand but Hobson bobbled slightly, providing her adversary with a gap she wouldn't relinquish for the remainder of the race. "I had just caught back on to her," recounted Hobson "and then I was like, okay this is good and then.... the sand. Sometimes you make it and sometimes you don't and she got another gap and I don't think I had anything left to try and catch her again." Bietola concurred: "That was where I gained my time. Once I got my gap I just kept going and it was easy to get a bigger gap as the race went on." Starting the third lap the 19-year old part-time caterer held a 10-second gap over Hobson, with Illingworth another 30 seconds in arrears. Illingworth wasn't finding the course to her liking, however, and Marceau was able to make a definitive pass halfway around the circuit. "My strong point is on the hills", said Marceau. "When I saw (Illingworth on) the long hill I knew maybe I can catch her so I just gave everything on the hill and I caught her. But the race before she was strong. It was flat and she did the same thing to me so it was a little revenge." 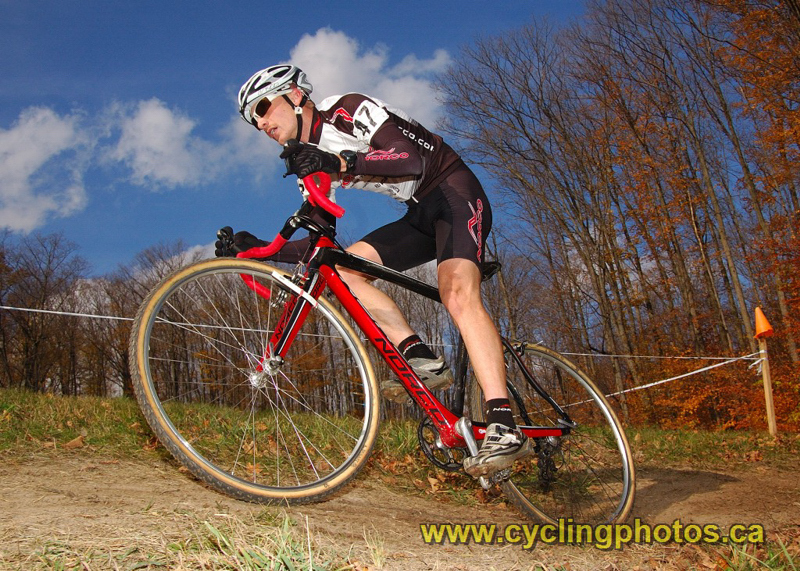 With two wins in as many weeks, Bietola is excited about 'Cross Nationals: "I'm looking forward to it. I think I will have a good race next weekend. I've been training lots for it so I'm expecting to have a good race." Two Master Women riders were in the Hallowe'en spirit. Michelle Cordy (HBCC) was dressed as the Jolly Roger, complete with cutlass in hand. "ARRRR!" She kindly doled out skull and crossbones cookies after the race. Sandra Deegan (Novofit) took to the course in a yellow and black Uma Thurman 'Kill Bill' outfit. With the national championships less than a week away, Watson felt a hard ride was necessary to bring his form to its peak. The 28-year old from nearby Craighurst got the holeshot, shifted into high gear and rode away from the Elite Men's field, winning with a gap of more than three minutes. "I really wanted to blow the legs out for next Saturday before nationals," he explained. "I went out pretty hard right from the start and just tried to make myself hurt as much as possible. I could have maybe gone a little easier and played things a little more tactically but I just wanted to get a really good hard ride in today and really test myself going into next weekend." After one lap he had a 30- second lead over Peter Morse (Jet Fuel/La Bicicletta) and Peter Mancini (Esteemtraining.com). Chasing that pair were Mark Brusso (Lapdogs), Bretton Matthews (Total Sports/The Bike Shop) and Tim Carleton (Rideallday p/b Real Deal). After two laps Watson had nearly doubled his advantage, while Morse had gapped Mancini by 15 seconds. Morse kept the pressure on to secure second place. "It was a tough race, the guys were always within 20 or 30 seconds behind so I had to always check over my shoulder and see where they were," he said. "If they got close I'd just try and go faster. I always try and save something for the last lap, which I kind of needed today 'cause the guy almost caught me on the last lap. In the last minute of the race I had to drill it." With the first two positions seemingly assured, a battle royal ensued for the podium's third step. Brusso, Matthews and Carleton swept up Mancini and the quartet swapped positions for the rest of the race. The youngest of the bunch was Matthews but he managed to judge his effort to perfection and was rewarded with a third-place finish. "I started off a little slower, kind of ramping it up and speeding up as the laps went by," said the 18-year old from Midland. Mancini finished in fifth and admitted to having made a critical error: "I put in a hard dig with about four to go. I was up in third place and had a good gap and yeah, I think I might have gone a bit too hard with too many laps left." Contrary to Watson's approach, a number of the usual suspects were not in attendance, presumably saving themselves for Saturday's big race. Zach Hughes (Norco Factory Team) was at Hardwood pre-riding the course but didn't take the start.